It's funny, the kinds of things you get nostalgic for. How food can call up a certain memory, take you back to a certain place. With this ice cream, I was trying to do just that--call up the year 2006, early Fall, when I'd just arrived at Emerson College and was trying to find my way around the city with my roommates. Our block on Boylston Street (right next to the Common) had many great dining options, which was great because we soon found our dining hall to be "only okay" in terms of deliciousness. One night, just as a chill began to settle in, we quelled an ice cream craving with a trip to Coldstone Creamery. I had never been. Back home, it was sacrilege to go to Coldstone. Why go to a chain when there was a plethora of locally-owned businesses with homemade ice cream? Locals even cheered triumphantly when a Coldstone storefront only lasted a year downtown before closing its doors. But we were hungry for sugar, it was dark, and the city was too scary to explore looking for a Mom & Pop type place. Coldstone became the short-term solution for a late night ice cream craving. Especially after I found a fully loaded gift card in a secondhand sweatshirt. I only ever had one flavor, but that was all I needed. White Chocolate, with marshmallows mixed in. Since I got two free mix-ins, but only wanted one, I always just asked for rainbow sprinkles. This was my go-to ice cream. Whenever the drippy dining hall fro-yo became too much, someone would suggest the five minute walk to Coldstone and we'd all follow. A well-meaning new friend assumed I was simply a white chocolate lover and gave me a three pound slab of the stuff for my birthday--strangely enough, this was the only way I enjoyed white chocolate: in my indulgent little ice cream. Imagine my horror when they no longer carried mini marshmallows for the mixing. My routine ruined, I pushed for frequenting JP Lick's, Emack & Bolio's, or, if we could handle the trek to Cambridge or Allston, the former Herrell's spots there. But I never found the exact combo again. 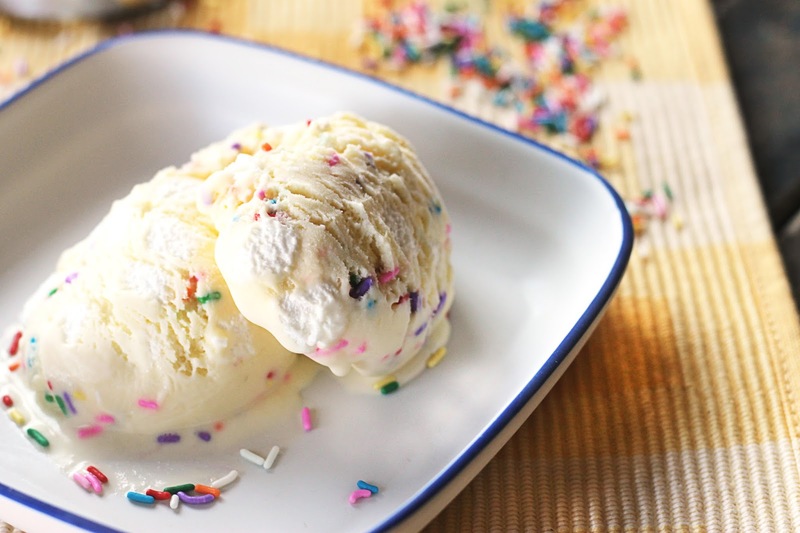 White chocolate ice cream, with mini marshmallows and rainbow sprinkles folded in, will always remind me of that first year of college. Now, I can happily make my own, when the feeling strikes. -Over medium-high heat, cook cream, milk, and salt stirring occasionally, until the mixture is hot. (Fill a large bowl with ice and water. Place a large, clean bowl in the ice bath and fit the bowl with a fine-mesh strainer.) <--I always skip this step and things turn out just fine, btw. -In a medium bowl, whisk together the egg yolks and the sugar until well blended. In another bowl, place the white chocolate. -Transfer the yolk mixture back to the saucepan with the remaining cream mixture while whisking vigorously and return it to medium heat. Cook, stirring constantly with a silicone spatula and scrape the bottom of the saucepan so it doesn't scorch, until the liquid begins to steam and the cream has thickened, 2 to 3 minutes. Remove from heat. -Immediately pour the hot custard into the bowl with the white chocolate. Let sit for a few minutes, then whisk vigorously until the white chocolate is melted and combined with the custard. -Strain the mixture into the cold, clean bowl and refrigerate, stirring every 20 minutes for the first hour or so, then occasionally every hour after that (for me this means "when I remember to"--again, turns out fine). When the custard is cold, leave in fridge for an additional hour or preferably overnight. -When you are ready to make the ice cream, transfer it to an ice cream maker and spin according to the manufacturer’s instructions. 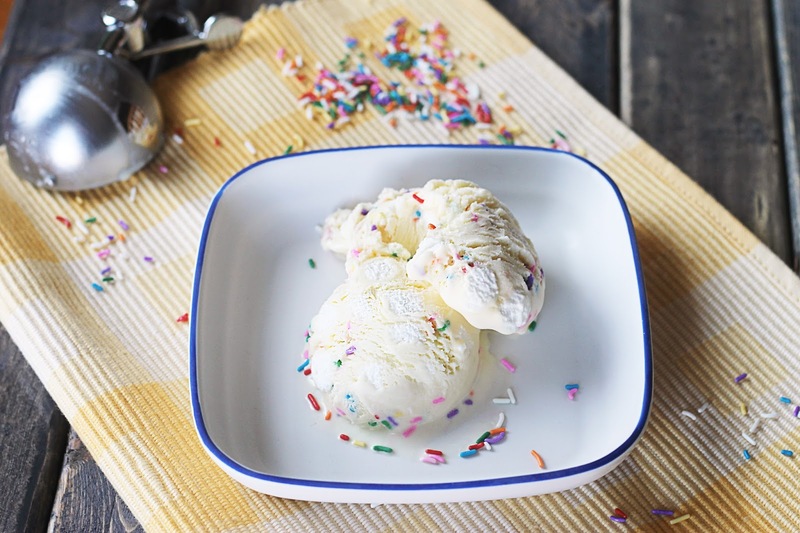 Once ice cream has churned for the recommended time, pour in the mini marshmallows and the sprinkles. Churn until well combined. -Pour the ice cream by the cup into your desired ice cream holder or eat immediately if you like it at thick-milkshake-consistency. 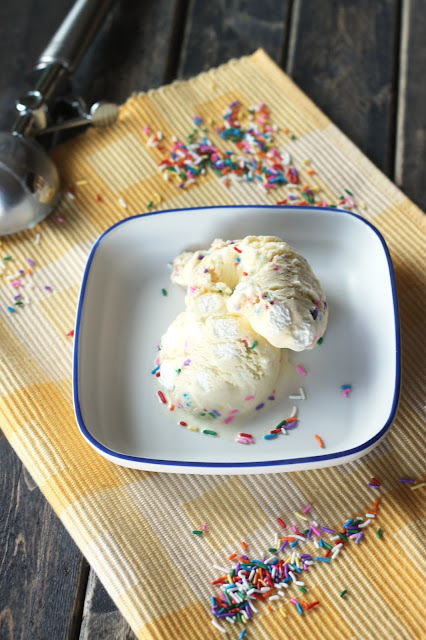 Freeze overnight for more traditional ice cream texture. Marshmallows are one of my favorite mix ins, too. My second choice is always almonds. I like crunchy in my ice cream. I love that your recipe makes a custard before making the ice cream. That's truly the way to ensure a rich and delicious ice cream. It's the old fashioned way. I love this, and I can't wait to try it. I hope you'll forgive me for choosing my almonds over your sprinkles, though. I often get sudden cravings for food I used to eat a lot in certain stages of my life...most times things from my childhood! I love travelling back in time like that! Often, the food somehow never tastes quite the same as you remember it, but in the case of your ice cream, I am sure it might have been even better than store-bought! It looks delish! I LOVE LOVE food that brings back memories. For me it's making my mom's clam chowder, or peanut butter and jelly on a ritz cracker. But I couldn't tell you now the last time I saw a Coldstone around Boston! Maybe it's my undying love for Emack and Bolio's ice cream. 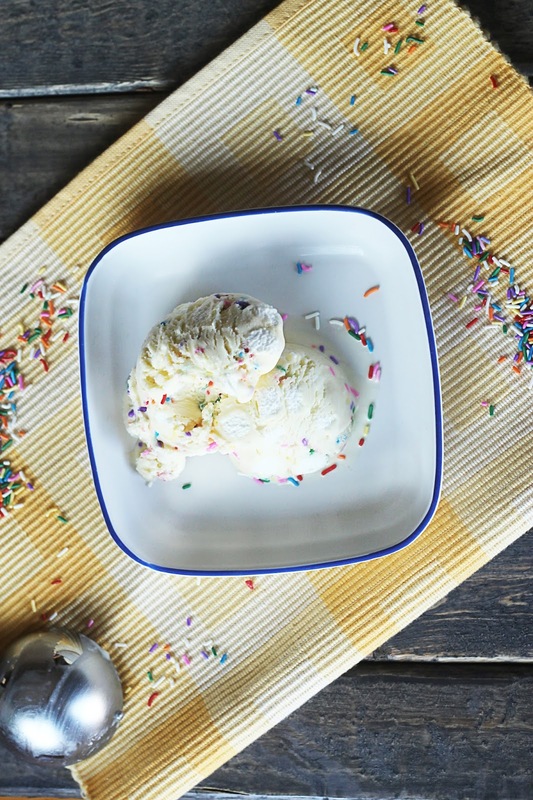 THIS ice cream sounds heavenly and I would definitely be down to get a test taste of it! I am not a big fan of white chocolate more like a dark chocolate fan but kinda weird that some how white chocolate in an ice cream is the best thing EVER ! This sounds so lush..! OMG! the look of this ice cream. Delicious and creamy! Plus the use marshmallow. Genius! A must try this summer! There was an Italian bakery that made doughnuts near my college... We'd walk up at 2 in the morning when the first ones came out of the oven. Light as feathers, the freshly baked ones were... Thanks for the memory! And rainbow spsrinkles on white chocolate ice cream are just so right! Yum! I love marshmallows and have always enjoyed the flavor of them with ice cream. Ice cream is my weakness. I have no self-control when it comes to that rich, cold, creamy dessert. Now the white chocolate sounds decadent. WOW!! I'd love to give it a taste. YUMMY!! White chocolate in an ice cream! This looks so creamy and delicious, marshmallows are PLUS. Can't wait to try this out. I love this post! What a fun way to bring back a memory! My kids would devour this ice cream! I love the addition of the Godiva white chocolate bar....yummy!! Girl, this totally took me back to college! I lived in the new dorms that got the short end of the stick for dining halls. We often ventured out to other dining halls and occasionally Coldstone Creamery (at the beginning of the month, if you know what I'm sayin'). It was always such a treat to go off campus and get something truly indulgent (and delicious)! Thanks for the trip down memory lane! Such a pretty ice cream with those sprinkles! Great that you can now make your own ice cream with mixed in marshmallows. It sounds delicious!